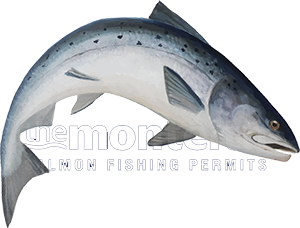 The depth of your salmon fly is an important part of success in salmon fishing so in the next few paragraphs I'll give you a few of my own personal thoughts to hopefully clear up a few misconceptions on this fascinating topic. It has become apparantly obvious over the years that although many salmon anglers fully understand all about the different densities and lengths of the sink tips that are available very few fully understand exactly where these tungsten impregnated sink tips are taking their salmon fly to in the water column in each and every differing water condition. These sinking tip additions which sometimes come as part of a Spey Line or Shooting Head 'system' as they're know these days are badged in various numbers and usually described typically as Type 3 or Type 6 etc. What these number are referring to is the depth of what a 1 inch cut section of this material would sink at if dropped into a glass of water i.e 3 inches or 6 inches per second. Therefore these digits bear zero reference as to the sink rate performance the same sink tip material would achieve in a flowing river. Salmon as predators hunt from below so a salmon that's in a serious taking mood will come a long way up off the rivebed to intercept a salmon fly if it wants it enough. On other ocassions a fly that's fished too high above a disinterested fish won't even generate a flicker of its dorsal fin. In normal salmon fishing conditions like that you really need to be able to present your fly through the square metre of water right infront of the salmon nose for half a chance of the desired reaction. I honestly believe that some of the salmon fishing book authors either have caught few salmon or had consumed far too many drams while they were writing. For example, 'deep & slow' in the early cold Spring and floating lines in the warm Summer water are logically inaccurate as there's much more chance of a salmon positioning itself high in the very cold water months where the warmer thermals are located as there is of a salmon lying deep on the bottom of the riverbed where the cooler water is to be found through the warmer Summer months. Let good old logic be your judge and these above contraditctions are more than likely because the authors never truly knew where their salmon fly was really fishing when they caught salmon as a heavy sunk line in the big water of Spring in any pool with half a flow will only be 'flight pathing' your fly about a foot down even though giving the angler the impression of a much deeper swim. A floating line in Summer on some of the shallower Scottish rivers will obviously place the salmon fly close enough to salmon unless its a deeper pool when the fly will fish way up too high over their heads. The other factors to undertand about fly fishing for salmon with sink tips or a full floatring line is to know what length of leader to use. The rule of thumb is to shorten the leader down to as little as 3 or 4ft if you're fishing a heavy sink tip as you don't want the fast sinking tip down deep and the fly still riding high because your leader is too long. With a higher fishing sink tip a 5ft to 6ft leader or a 10ft leader with a full floating line is normally about right. Leader strength selection should be all about the weight of the fly you're fishing as you'll need a bulky leader to transfer the engery to the fly as a light leader just will not be able to do that effectively. With a copper 2 inch tube fly I'd personally be using 4ft of 25lbs Maxima Chameleon monafilament to get the energy transfer turnover bang on. With a light size 9 or 11 late Spring or Summer fly on the Tay I'd be fishing between 15lbs & 18lbs Maxima and nothing lighter than that in case a high teenager or bigger salmon has a go as I don't want to wait until after spawning time to have a chance of landing it! I've never been a fan of fluorocarbon as it's no where near as reliable as Maxima for various reasons and I've personally seen far too many salmon escape capture even though it'll suit a tackle dealer to sell it! When I was a young salmon fisher and part time River Tay Summer ghillie in the 70's good old Maxima was doing a reliable job then just as it does today for many Tay ghillies so on the basis that 'if it's not broken (excuse the pun) then why fix it'. One of the anglers was dropped off on the far side of the Tay one morning before the ghillie went boat fishing to the other end of the beat. The angler landed a salmon even though when he started to fish he got his fly snagged and lost the only leader he had as he'd forgot to lift his spare leader material from his car boot that morning. He had in desperation stripped back a few inches of the pvc coating from the front of his fly line and tied a fly onto the braided core!